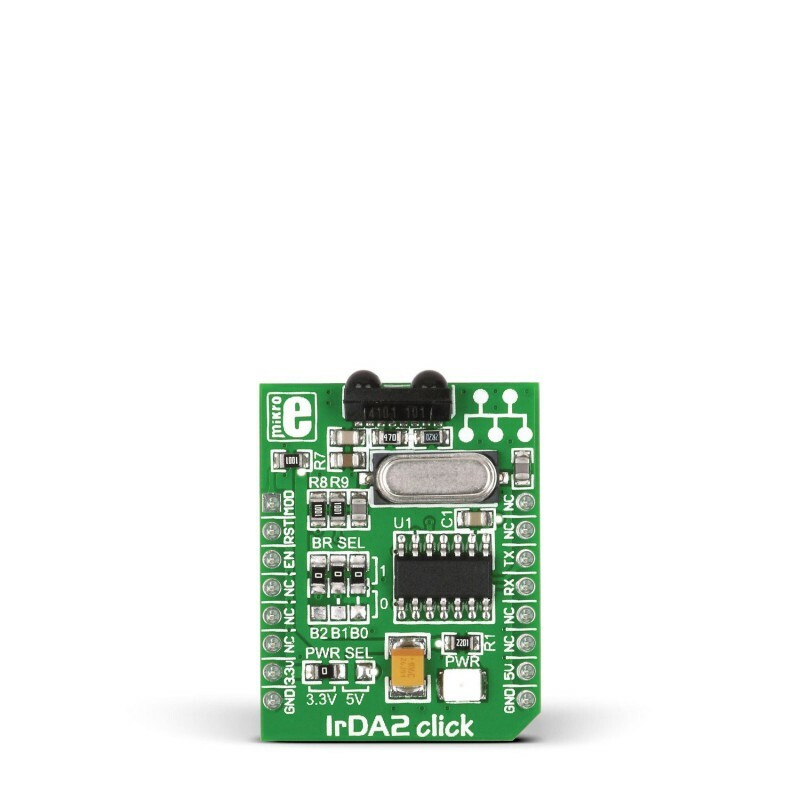 IrDA2 click features the TFDU4101 infrared transceiver module as well as MCP2120 infrared encoder/decoder from Microchip connected with the 7.3728 MHz external crystal. The click is designed to run on either 3.3V or 5V power supply. It communicates with the target board via UART interface and the following mikroBUS™ pins: AN, RST, CS. IrDA2 click is a compact and easy solution for adding infrared communication to your device. 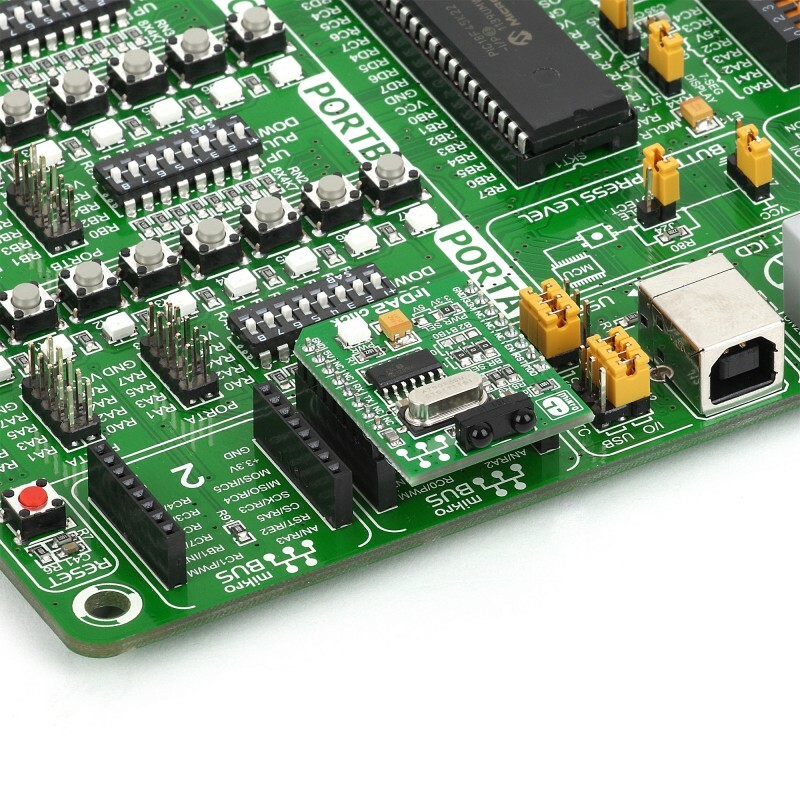 It features TFDU4101 infrared transceiver module as well as MCP2120 infrared encoder/decoder from Microchip connected with the 7.3728 MHz external crystal. The click is designed to run on either 3.3V or 5V power supply. 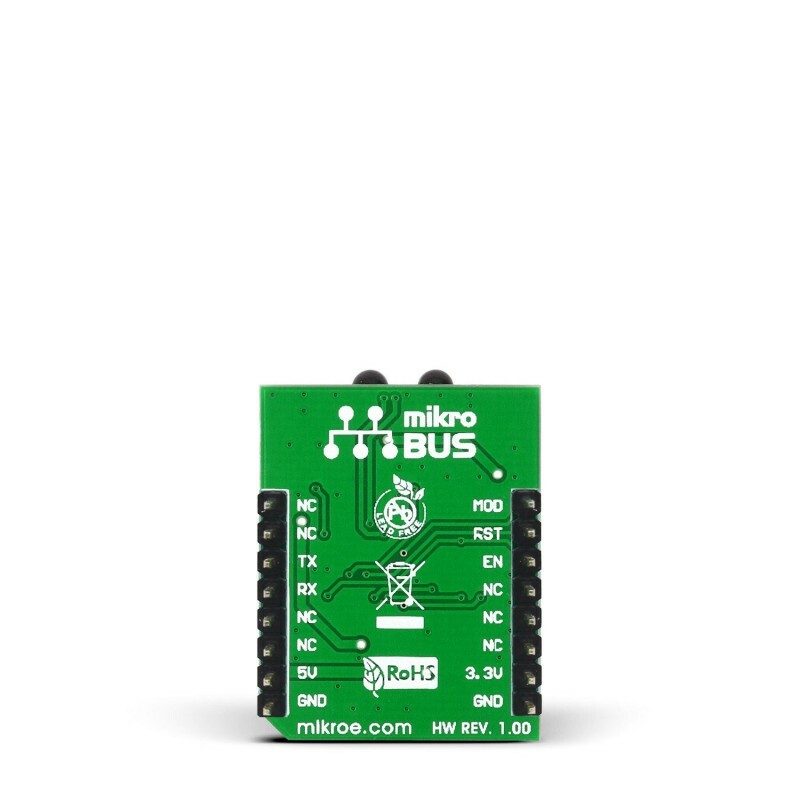 It communicates with the target board via UART interface and the following mikroBUS™ pins: AN, RST, CS. The combination of the TFDU4101 and MCP2120 results in support for fast and stable infrared data communication. The TFDU4101 infrared transceiver module covers the full IrDA range of more than 1m and speed up to 115.2 kbit/s. With low power consumption, all these features make IrDA2 click ideal for TV and video systems, printers, fax machines, copiers, external infrared adapters, diagnostic systems and other industrial applications. Applications IrDA2 board is ideal for wireless infra red data communication with PC remote controllers for home applicances and other devices. This table shows how the pinout on IrDA2 click corresponds to the pinout on the mikroBUS™ socket (the latter shown in the two middle columns). Jumpers J0, J1 and J2 connect MCP2120 controller BAUD0, BAUD1 and BAUD2 pins to VCC or GND. You can change baud rate settings by soldering J0, J1 and J2 in the appropriate position (Table 1). These jumpers are soldered in logic 1 position by default (9600 bps, software selection enabled). SMD jumper J3 is used to select 5V or 3.3V power supply (default position is 3.3V). Code examples for IrDA2 click, written for MikroElektronika hardware and compilers are available on Libstock. 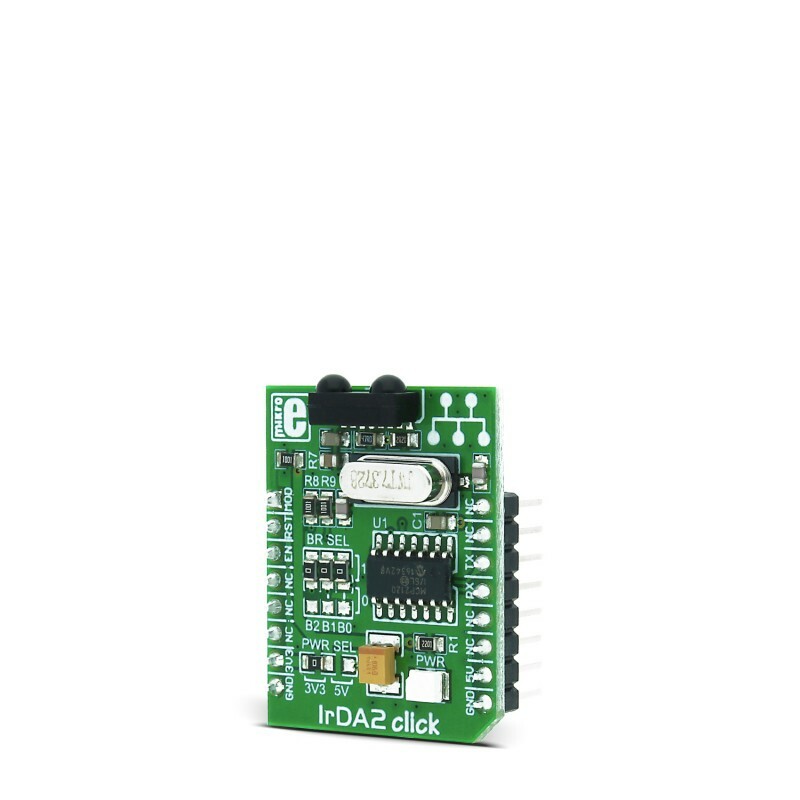 This example demonstrates the functionality of the IrDA2 Click board. The master initiates communication with the slave by sending 1 byte of data to the slave. The slave accepts data, increments it and sends it back to the master. The data received is shown on PORTD.